On November 14, the Community Center for the Performing Arts Board of Directors signed a Deed of Gift with the University of Oregon, completing the legal process for donating WOW Hall records to the UO Archives. Board Chair Aaron Dietrich signed on behalf of the CCPA, and James Fox for the U. of O. 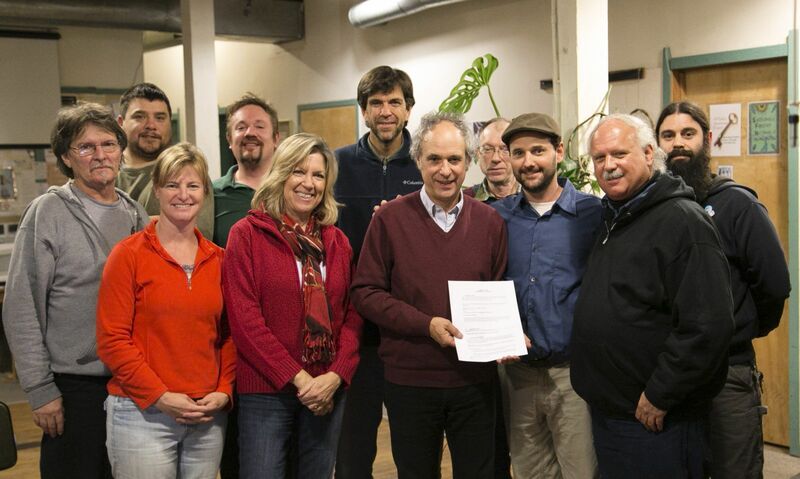 The signing completed a nearly year-long process by the board and UO staff to finalize the agreement, whereby WOW Hall archives will now be preserved alongside the writings of Ken Kesey, Ursula Le Guin and many other valuable contributions to our to culture, literature and history. Prior to the signing, James Fox from University of Oregon discussed details about our Deed of Gift. UO will be responsible for organizing, storing in controlled environment, and allowing access. Items will always be available to WOW Hall. We no longer own the items, they will belong to the state of Oregon, but we can borrow them to exhibit them if we fill out a loan form; the more lead time the better. We retain copyrights of things we have rights to, including minutes and poster art we created. Copyright details were discussed. UO is taking on responsibility and cost of organizing, preserving, and is committing time and resources to the collection. Signing the Deed of Gift is really just a beginning for the archive project. The UO will take possession in spring or summer and then it will be a couple of years before items become available to the public. In the meantime, they will need help from the WOW Hall to help process papers. As James explained, the UO will only take what the WOW Hall gives them, and the organization retains first rights on anything they decide not to archive. Possible documents to archive include show posters, show files, board minutes, financial records and newsletters, as well as CDs and cassette tapes. The CCPA will retain all its records for ten years, at which point they may be added to the archives. Anyone interested in helping with the archive project should contact the WOW Hall office.